Every moment in the water is better with Speedo. 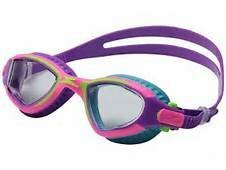 The Speedo Jr. MDR 2.4 Goggle delivers enhanced peripheral vision for exceptional performance. The anti-fog design and UV protecting lenses help you keep your eyes on the finish line. Speed Fit clips at strap: For easy adjustment. Dual density TPR frame: For superior flexibility. ClearSight technology: Prevents eye fatigue for greater peripheral vision. Elastometric technology: Reduces goggle pressure around the eyes.